A new report by the Centers for Disease Control and Prevention (CDC) is spurring headlines that Zika-linked birth defects have reached new levels in the United States. Experts, other research, and the CDC itself, however, say that the connection between the disease and birth defects is unproven. Some have suggested the media’s oversimplified headlines on Zika have amounted to fearmongering. Chief among the challenges in drawing conclusive connections between Zika and birth defects is the challenge of testing for Zika itself. The new CDC report finds that out of 1,297 pregnant U.S. women (with 972 completed pregnancies) possibly infected by Zika, 51 women (or 5 percent) had children with birth defects in 2016. James Grundvig, investigative journalist and author, questioned the accuracy of the data. “It’s hard to say it’s accurate. Here’s why: What is the baseline for similar studies on pregnant women prior to Zika coming to U.S.?” he said. Out of the 975 completed pregnancies, only 250 women were actually confirmed to have Zika. Out of those 250 pregnancies, 24 birth defects were reported. Media coverage of this report muddies the water further, said Grundvig. For example, an April 4 headline from NPR, “51 Babies Born With Zika-Related Birth Defects in the U.S. Last Year,” reads as if Zika caused the birth defects. CDC’s inclusion of the unconfirmed Zika pregnancy cases also inflates the numbers and promotes fearmongering, said Grundvig. “Because of inaccurate testing, Zika is overblown. It contributes to confusion. They haven’t established a baseline that is universally accepted, within the CDC itself,” he said. Zika coverage is typically accompanied by photos of babies with underdeveloped heads, a birth defect called microcephaly that is caused by abnormal brain development. New research raises doubts about the link between Zika and microcephaly. In 2015, Brazilian scientists attributed a surge of microcephaly cases to Zika. The scientists predicted an even larger increase in the incidence of microcephaly in 2016, due to the growth of Zika in Brazil. But the incidence of microcephaly did not track with the incidence of Zika, according to a report published in the New England Journal of Medicine on March 29. Dr. Christopher Dye, director of strategy at the World Health Organization (WHO) and one of the authors of the report, said there was a “big difference” between the number of reported microcephaly cases between 2015 and 2016. “The question is, when you have an outbreak of Zika virus, does it always cause microcephaly, or does it only sometimes cause microcephaly?” he said. Dr. William May, co-director of the Johns Hopkins Zika Center, says other infections can also cause microcephaly. “There’s no one piece of evidence that really proves that Zika directly causes microcephaly. It’s just the amount of different evidences. … There are other intrauterine infections that can also cause microcephaly,” said May. Researchers using 3-D model simulations did uncover an association between Zika and microcephaly, but no real-world proof has been found. 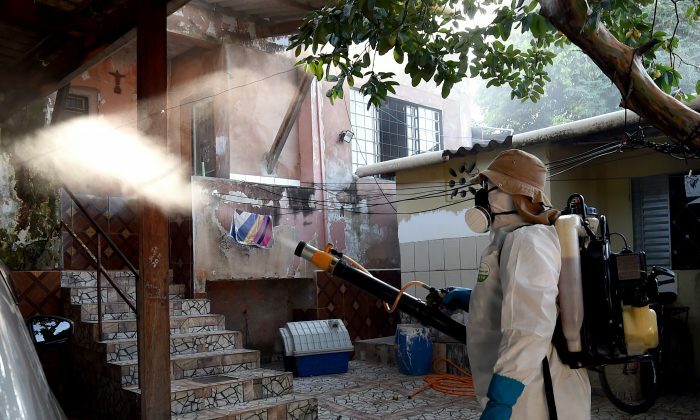 “While [Zika] infections have been associated with microcephaly, we haven’t been able to show it causes it [directly] in a patient,” said Kavya Swaminathan, a postdoctoral research fellow in chemical and systems biology at Stanford University. If microcephaly is caused by the Zika virus, however, there may be another reason for why Brazil saw no rise in cases of the condition. “It could be that the [Brazil] population developed immunity. This is a virus and our systems are capable of finding a way to defend against these viruses. [Perhaps] some of these people were not pregnant when they caught the virus, but eventually when they did get pregnant, they were already immune to the virus,” Swaminathan said. There does appear to be a link between Zika and microcephaly, but it’s hard to quantify, said Ashley Roman, director of maternal fetal medicine at NYU Langone Medical Center. In most pregnancies of women infected with Zika, the fetuses appear to develop healthily. “What’s going to be important over time is understanding what happens in the early childhood of these infants who have been exposed to Zika virus,” she said. The report suggests that the surge of microcephaly in 2015 was most likely not from Zika but from similar diseases transmitted by mosquitoes, such as dengue and chikungunya fevers. According to the CDC, from 2015 to Mar. 29, 2017, there were 4,886 cases reported in from travelers returning to the United States from affected areas. However, there were only 222 reported cases of Zika from “presumably” locally born mosquitos, in Florida and Texas. In the United States, geography and climate keep the risk of Zika transmission from locally born mosquitoes low. “The main mosquito is really a tropical mosquito, so the distribution is confined to the hot, wet parts of the southern United States,” said Dye. Meanwhile, about 1 in 3 Americans believe incorrectly that Zika can be transmitted through coughing or sneezing, according to a 2016 poll by the T.H. Chan School of Public Health at Harvard. In fact, Zika is transmitted through mosquito bites, sexual transmission, or blood transfusion, or from mother to child, according to the CDC. Common symptoms of Zika virus usually last two to seven days, according to WHO, and include mild fever, skin rash, conjunctivitis, muscle and joint pain, and headaches.